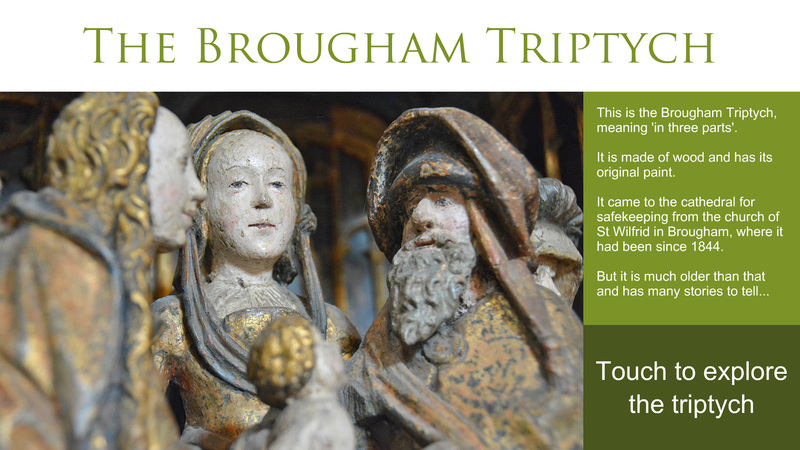 Carlisle Cathedral is home to a beautifully-carved Flemish triptych dating from the 16th century - the Brougham Triptych. 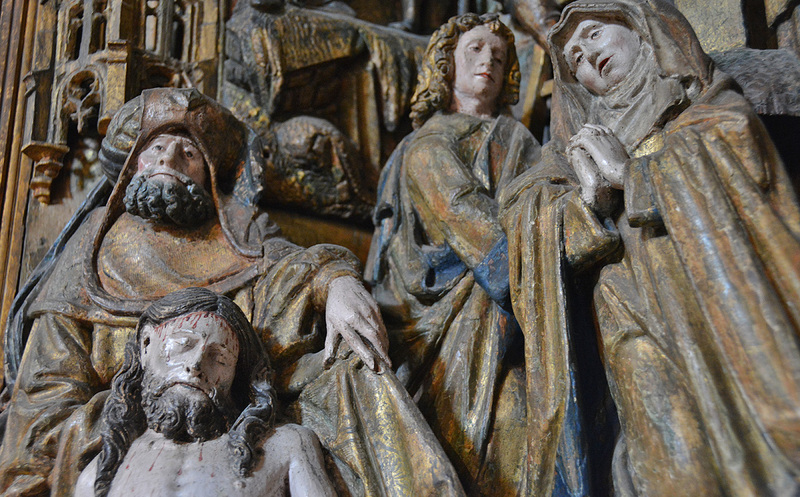 The triptych is visible to cathedral visitors, but due to its delicate nature it is positioned behind a set of railed iron gates at a distance of 4-5 meters. While this provides good protection for this rare and fragile piece, the skill and intricacy within its carvings and arrangement are lost. 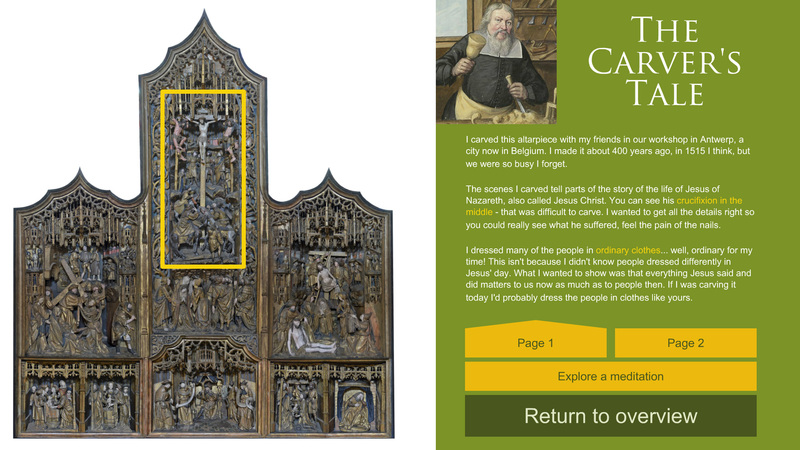 The project aimed to explore technological solutions that could bring the triptych's marvels closer to the visitor and aid understanding and reflection. 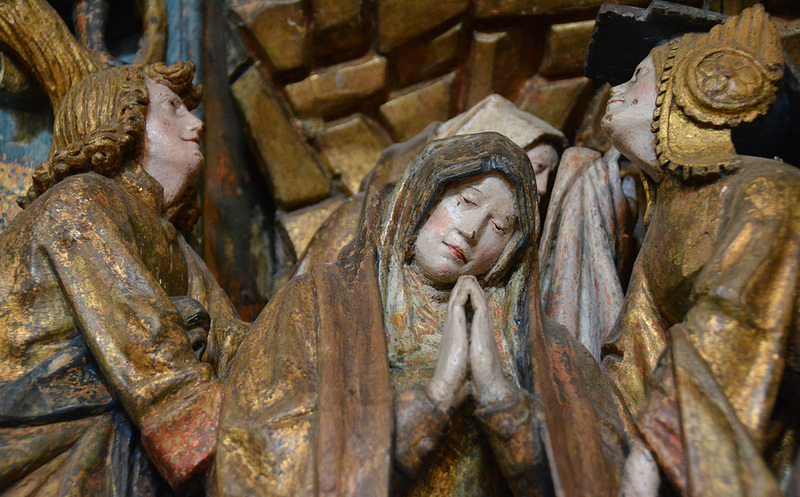 Purchased for a church at Brougham (near Penrith) in the mid-19th century, the triptych was originally made in Antwerp in modern-day Belgium for a church probably in Cologne, Germany. 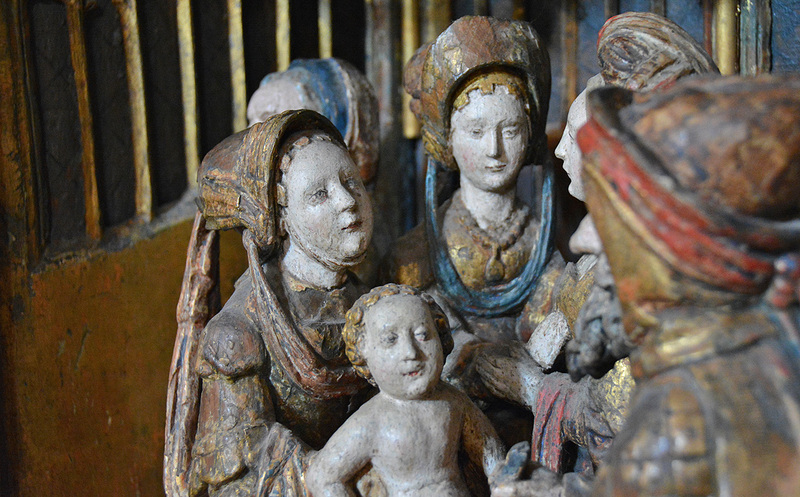 The richly-painted carvings depict the birth and Passion of Jesus and are a good example of the Antwerp school of carvers. The triptych was moved to the cathedral by the parish of St Wilfrid's, Brougham for safekeeping. Whilst acknowledging the huge historical significance, the cathedral were also interested in how the triptych could be used as a focus for contemplation and reflection. 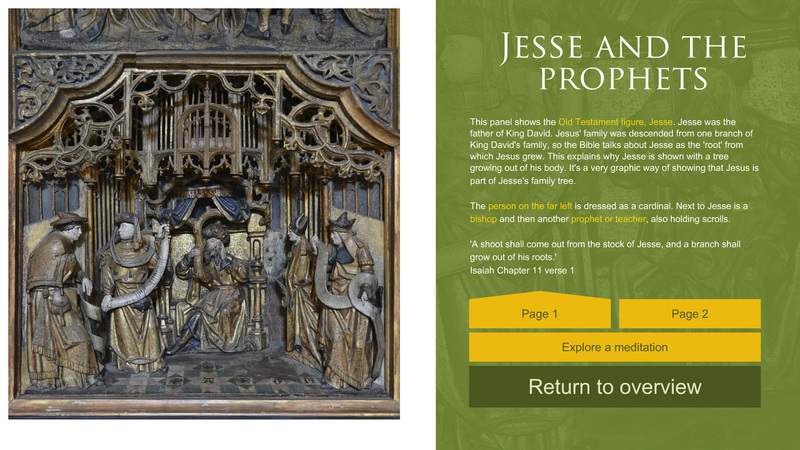 To address these issues, an interactive touchscreen display was designed to sit immediately alongside the railed gates that separate triptych and public. 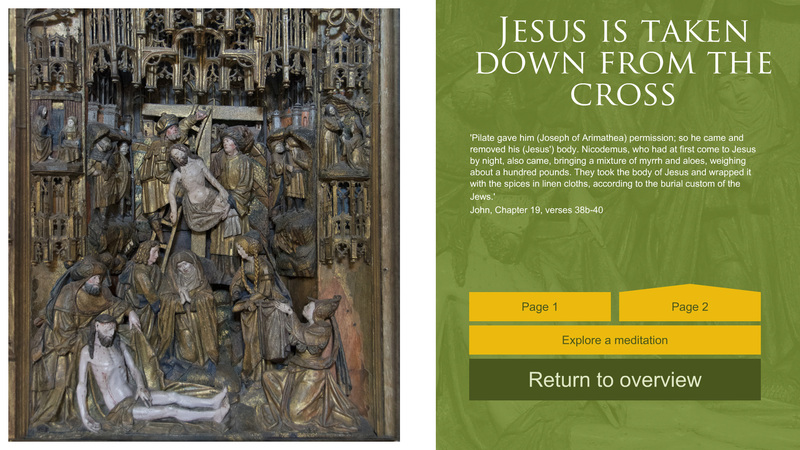 High-resolution photography was utilised to allow visitor's to 'zoom in' on sections of the triptych, providing the means to explore the various scenes and follow the story of Christ's Passion from beginning to end. 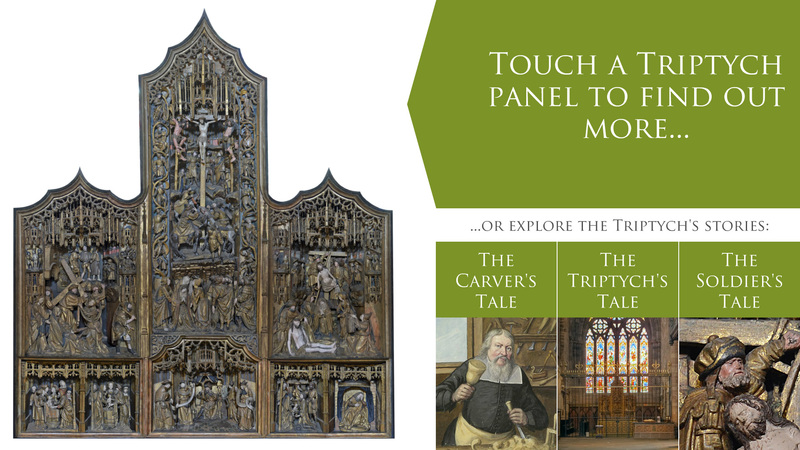 A more general history of the triptych was also included, detailing the inclusions, omissions and rearrangements that reflect its somewhat chequered history. This was presented as a series of 'stories' told from different viewpoints (eg. 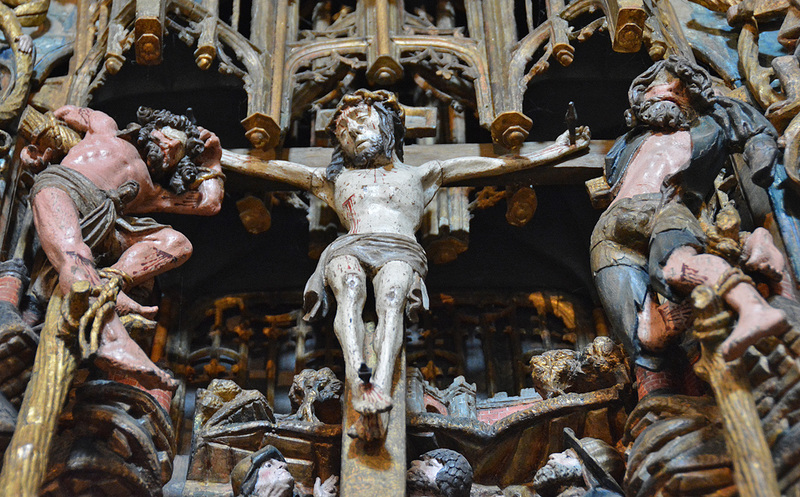 a carver, a soldier charged with the job of crucifying Jesus, the triptych itself), to allow the various layers of history and spiritual engagement to be interwoven and presented in a light-touch and intriguing way. 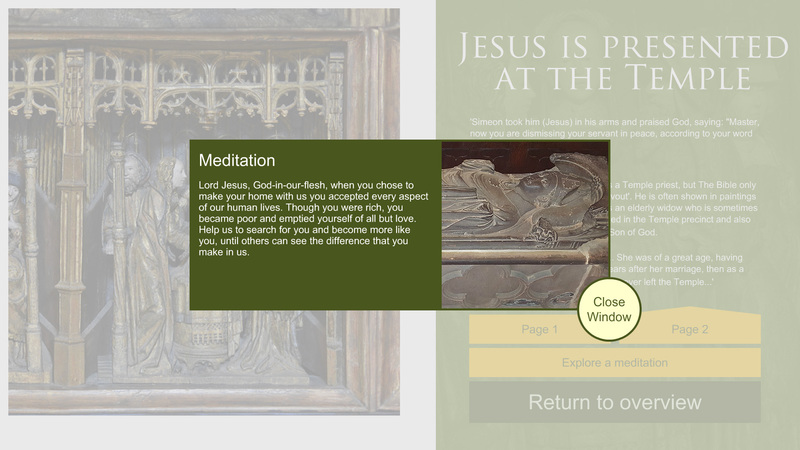 The Canon Missioner, Michael Manley, provided short prayers and reflections based on the scenes portrayed, which are available on the touchscreen. This combination of history and spiritual content is a feature of our projects and a key driver for many of our clients.